Description: The spider plant is a perennial plant used primarily as a houseplant. The leaves grow radially outward from the center in a fashion that resembles a spider. Leaf color can range from a deep green to silver/white. Long, modified stems, called stolons grow from the center of the plant to produce either flowers or small plantlets at the tip. Flowers have white petals and yellow stigma. Plantlets not only resemble miniature spider plants, but can also be removed and propagated asexually in rooting media. Watering: Keep soil evenly moist, but not saturated. Fertilization: Plant should be fed every three to four months with a general-purpose fertilizer. Lighting: This plant can tolerate full direct sunlight, but will do better in a shaded or filtered light environment. 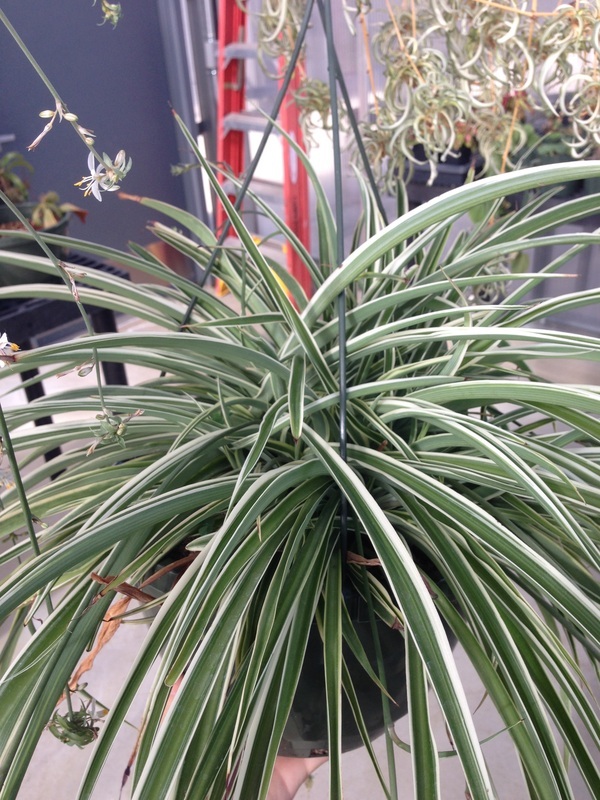 Use: The spider plant can be used as a solitary houseplant or in a mixed bowl arrangement, as its foliage provides interesting contrast and texture. Propagation: When the plant is flowering, the stem will also produce small plantlets that resemble miniature spider plants. These plantlets may be propagated asexually by removing them from the stem and placing them into a rooting media until rooting occurs. Alternatively, plantlets still attached to stems may be suspended over water until roots develop. With this method, it is important that the leaves are kept out of the water. Rooted plantlets can be transplanted when the roots are about as large as the leaves. Rooting usually takes about a week. Special Accommodations: No special accommodations are needed. Leaf tips may brown due to high salt concentrations in water, use RO/DI water to avoid this or periodically apply extra water during irrigation so that water runs from the bottom of the pot. This process will leach salts out of the media.